It seems the latest fad is to buy something that is fairly key to your well being without even trying it first. How badly wrong can that go? OK, so we all know that most furniture shops with their endless sales are a total con. I was having some issues and decided to buy a new mattress about 5 years ago. I made the mistake of listening to the guy in the shop who recommended a certain brand as being good for larger people (I’m well over 6ft tall with a waist somewhat larger than I’d prefer) and with a 10 year warranty. Well after less than 5 years the foam top layer has pretty much gone and I’m convinced some springs have broken. I’ve put in a warranty claim but I have no doubt they will say ‘fair wear and tear’. Sigh…. So, off I went mattress hunting again. Didn’t really fancy anything in the shops as Tempur are horrifically expensive I hate the dead feeling from memory foam. I also didn’t fancy another coil sprung mattress. The new fad is for on-line companies to sell you a vacuum packed foam mattress with a 100 or more night trial period. This started in the USA and has now spread here. So I did some research, sent some emails and one company assured me that, based on their US feedback, their mattress was good for 350+ lbs. More than adequate for me! The US website says 450lbs max. All good! Minor niggle though as their US website stated the mattress was 10″ deep and the UK website description added up to a paltry 22cm. Only just over 8.5″. Maybe this was a typo? Could be! Anyway, mattress was duly ordered and I awaited the shipping notification…. and waited… and waited… Emailed them a week after the order to be told it had not been made yet and would be a couple more days. OK, that’s fine I thought. Well it wasn’t as I got a message from the other half telling me there was a box left by the front door with the mattress in it! Hmm… maybe they are just a little snowed under. But it should not have just been dumped as it is a fair chunk of money! The next message from the other half indicated why they had left it… the box was pretty much destroyed! Not at all well packed! 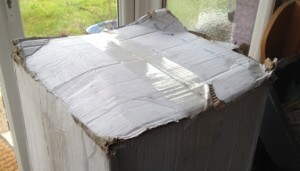 The mattress was flopping about in the single layer cardboard box so had bashed its way through the seams. 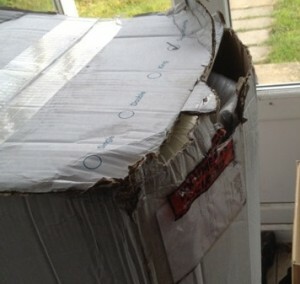 Thankfully the mattress was well wrapped so had not suffered damage. I got home all happy wanting to try out the new mattress and carried it upstairs. On to problems 3 and 4 as 3) the fact I could easily carry it indicated it can’t have that much foam in it and 4) the box still ripped at the handles in the process. Not impressed! So we get the old mattress off the bed (which weighs more than the new one) and unfold the new one. Time for some supper while the foam regains its original size after being vac packed. By bed time its up to 8″ thick so time to try it! *THUNK* I go straight through the foam and hit the bed base! What?? This is supposed to be a medium firm mattress good for people much heavier than me. Hmm.. maybe it just needs another day to recover its spring. Uncomfortable night number 1. Next day the mattress is getting close to 9″. Maybe the website wasn’t a typo?? Starting to think the UK spec is different to the US spec after all. Oh dear, those claims based on US feedback are not going to ring true are they? *THUNK* still hitting the base. Uncomfortable night number 2! So much for the second night being the best night of sleep ever. Its still not quite 9″ thick. OK, its not the same spec is it? Other half decided to bail to the spare bed and she weighs a lot less than me. Uncomfortable night number 3. OK, sod this, old mattress is going back on and I’m calling them! Guy on the phone wants me to keep at it for a minimum of 30 nights. Not a chance as I pointed out that I’d bought it on the basis of certain claims which are quite obviously not true. They tried to say the UK version was only marginally thinner until I pointed out 22cm is more than 10% less than 10″. They finally offered to come get it and fully refund me. Hurrah! Not that they had much of a case. I’d asked if it would cope with my weight, they said yes based on a product which was different to what I was sold. Distance selling 101 in action.